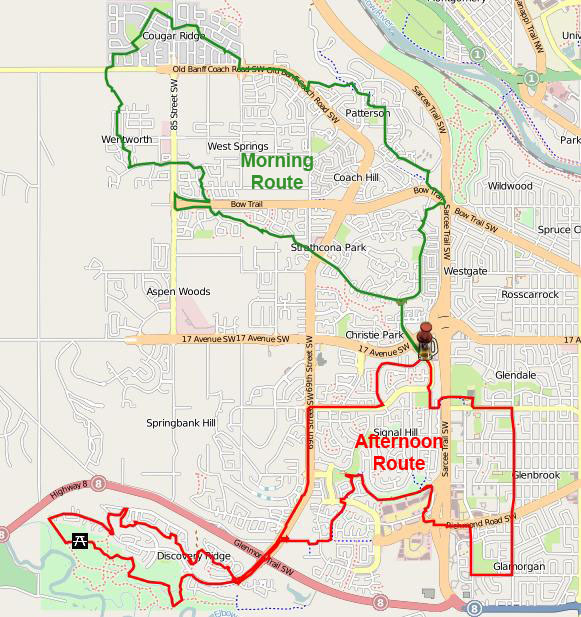 A choice between a 16km ride (9:30am), a 22km ride (11:30am) or the full 40km bike ride (9:30am) through the communities that make up Ward 6 including Christie Park, Cougar Ridge, Discovery Ridge, Glamorgan, Glenbrook, Glendale, Patterson, Signal Hill, Springbank Hill, Strathcona Park and West Springs. Will travel along pathways, bike lanes, sharrows and roads so should be comfortable sharing the road with traffic (though mostly residential - West Hills area is the sketchiest) and riding up hills. Will make 2 stops along route: 1) Griffith Woods park for lunch and/or exploration (~30 minutes); and 2) Shillelaghs Pub for a social drink/food. Will likely take about 4 hours to complete but depends on pace and time spent at lunch and social drink. This is not a race and will just be a leisurely ride to explore the bicycle infrastructure in Ward 6. Meet by 9:30am at West Market Square (1851 Sirocco Drive S.W.) for the 16km and 40km rides and at 11:30am for the afternoon 22km ride (with lunch and pub stop).